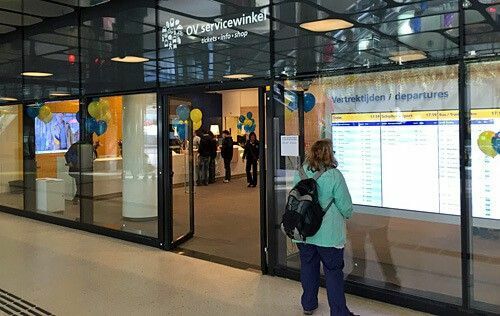 The Public Transport Service Shop, OV-servicewinkel, in Amsterdam answers all your questions with regard to public transport. The staff are a fount of knowledge. The Dutch transport system is fast, affordable and uncomplicated. Yet, you may have general questions or specific requests; the Public Transport Shop gives sound advice and solves all your queries concerning trams in Amsterdam, trains in the Netherlands and international trains. The OV-Servicewinkel aka Public Transport Shop supplies you with information about tram, bus, metro and train routes. Buy here your OV-chipcard, an electronic card required for all public transport in Amsterdam and the Netherlands. Activate and recharge your card here. The staff speaks English and will not refer you to another carrier or a website. They know everything about all public transport companies in Amsterdam; NS (Dutch Rail) for train services, GVB for all public transport in Amsterdam and Connexxion and EBS for regional bus services to and from Amsterdam. Touch-screens help you plan your route to popular destinations. The choice is yours; by public transport, on foot or by bicycle. When you have found your ideal route, simply print the itinerary for free and you are sure never to lose your way in Amsterdam.